The Ordnance Survey Characteristics Sheet collection (held at Map.X3.234) is a set of 40 items, dating between ca. 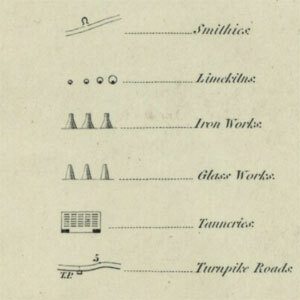 1840-1930, containing specimens of type, symbols and characteristics for various Ordnance Survey map series. Characteristics sheets or legends are crucial for interpreting the symbols and features used on early Ordnance Survey maps. However, Ordnance Survey did not regularly publish this information in a standard form for many map series in the 19th century, so this collection has a particular value and some items may be unique. Further information about this collection. We are very grateful to the Aurelius Trust for funding the conservation and digitisation of this collection. 10 Examples for the Size and Characters of the Names in the Ordnance Map. 25 Parish Indexes. Specimen to guide draftsmen in preparing 6 Inch Plans for reduction to 1 Inch scale. 26r A Specimen of the Print Hands, for the Instruction of the Cadets, in the Corps of Royal Military Surveyors and Draftsmen, Engraved by desire of Lieutenant General Mann, Inspector General of Fortifications. 33 Ordnance Survey of Great Britain. These sketches show the method adopted for indicating public boundaries on Ordnance Survey Maps… All these cases numbered hereon are specially referred to in the 1914 Edition of "Notes on Boundaries." 35 Specimen Sheet of Type used in the Production of Ordnance Survey Plans.